It’s walk time. A cute ginger and white dog wakes, eager for his morning walk. He wakes his bearded owner, excited at who they might meet in the park today. Will it be one itzy-bitzy Poodle, or two lovey-dovey Bolonoodles? 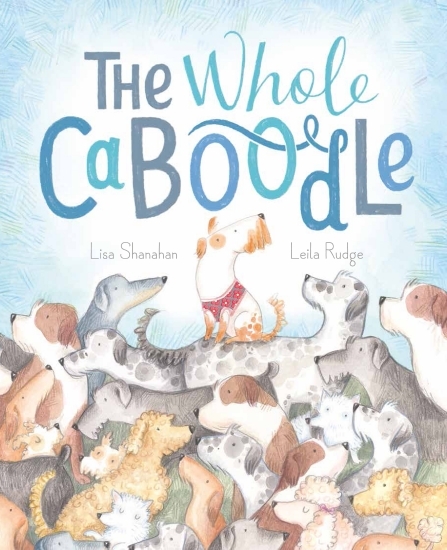 The Whole Caboodle is a gorgeous rhyming counting book, featuring not just the narrating dog, but a whole feast of dogs big and small, real and recreated. As the little dog and his owner prepare for their walk, each new dog is mimicked by something in the illustration. So, when one poodle is mentioned, there is a poodle teapot cosy as the owner eats breakfast, and the two Bolnoodles are represented by a pair of dog slippers. On the final spread, in the park, when they meet ‘the whole caboodle’, the real dogs are present, and readers will have fun spotting and counting them. Youngsters will enjoy the rhyming text, with its creative use of words created for tongue-twisting fun, and the illustrations with matching whimsical detail. This one will demand repeated rereadings. Everyone is arriving at the centre. It’s noisy and busy while Mark and Mai greet everyone. Mum is going to work. As the mums head off to work, their children settle in for a day of playing, and resting, and eating. What do mums do when they are wt work? And what do the children do while Mum is away? 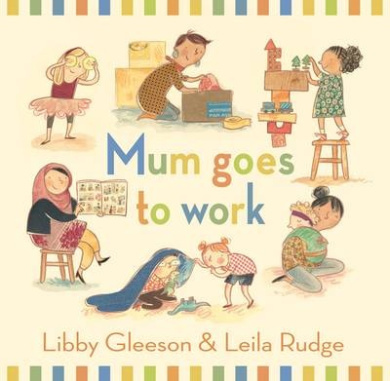 Mum Goes to Work is a beautiful picture book about mothers and children, and about child care centres. Each spread shows one mother at work, explaining what she does there, before looking at what the child and a friend do at the childcare centre. The children’s activities mirror what the mother is doing. So, while Laurence’s mother works in a cafe, Laurence and Georgia make sand cake and sand biscuits in the sandpit, and while Max’s mum works as a nurse, Max and Ann put the dolls to bed in the dress up corner. The illustrations show mums from lots of different backgrounds and, while the text focusses on mums, the illustrations show dads at drop off and pick up, too, a nice touch, as is the fact that one of the childcare workers is male. The illustrations, in watercolour, pencil and collage, are softly coloured and have lots of detail of both the childcare centre and the mothers’ workplaces, with mots spreads having several smaller pictures. This gives plenty to be explored on the repeated readings that the book is likely to have. Mum Goes to Work is an excellent offering, particularly for families who use childcare, and for centres, too. Ted had been at the pet shop for as long as he could remember. and he did his best to make a good impression. But there were so many other dogs that nobody noticed Ted. Ted is a little dog with a big problem. he doesn’t belong – and belonging is what he most wants. So he sets off to find the perfect place. He tries the circus, but everybody cheers the circus dogs and nobody notices Ted. Similarly, Ted doesn’t succeed as a pageant dog or a guard dog. Dejected, he is about to head back to the pet store when he comes across Dot, who is looking for a furry friend who enjoys long walks and ball games. Ted does his best to get noticed by Dot – and succeeds. Ted is an adorable picture book story about an adorable dog. He may not be suitable for any of the roles he tries, but he is a dog who will win the hearts of young, and not-so-young readers. The illustrations, using pencil and ink with touches of paper collage, have a gentle whimsy to them, with lots of detail for readers to explore and discover. Perfect for young animal lovers. Available from good booksellers or online. I’m in charge of this book so I know everything about it – including the most important thing, which is that there are NO BEARS in it. I’m tired of bears. Every time you read a book it’s just BEARS BEARS BEARS – horrible furry bears slurping honey in grotty little caves. You don’t need BEARS for a book. Ruby is the boss of this book and if she says there are no bears then there will be no bears – or will there? Ruby is determined to create a tale which is scary, exciting and pretty all at once – and contains no bears. So she tells a delightful story which meets all her requirements – except perhaps one. While she makes no mention of bears (except to say that there’s none of them) the young reader/viewer will love spotting the bear lurking in the book – and contributing to the action. Author Meg McKinley’s clever text is gorgeously complemented by the quirky digital illustrations of Leila Rudge for a whole which is whimsical, humorous and, simply delightful. A fun bedtime read full of gentle giggles for younger readers, with perhaps a bit of a message about inclusivity and friendship for older readers. Because class pets were allowed to come home if your parents said yes. And Abby’s parents had said yes. Abby’c class has a class pet – a class duck, in fact. Max is a gentle duck who sits on children’s feet, or waddles and quacks around the classroom. When Mrs Melvino says that no one can take Max home unless they have just the right conditions for a duck, Abby is determined to get things right so that she can be the first one to take Max home. But Noah, the new boy, who lives in the house behind Abby, wants to be first, too. Even when Abby has her chance to look after Max, it seems Noah is still plotting. Having a duck for a day could prove harder than Abby expects. Duck for a Day is a delightful new chapter book about class pets, responsibility and friendship. While Abby learns about what it takes to get what you truly want, she and Noah both learn about friendship, and the adults around them learn about trust. Most of all, though, young readers will enjoy the fun of seeing the chaos one little duck can cause as it waddles its way into the lives of the children. With whimsical grey-scale illustrations by Leila Rudge, this is novel to love. This book can be purchased online from Duck for a Day. Buying through this link supports Aussiereviews.